The Roman Monuments, Cathedral of St. Peter and Church of Our Lady in Trier are the testimonies of a Roman colony and its recognition of Christianity. Even before the Romans came there was a settlement in this valley. It belonged to the Gallo-Celtic tribe Treveri. Upon their culture, from which remains still can be seen in the regional museum, stumbled Julius Caesar when he conquered this territory in 57 BC. With Caesar the 500 year long Roman history of Trier began. The city became a cross-roads and a commercial link between major towns in France and along the Rhine. Trier has a classic rectangular layout, with the Forum (including the most important buildings) in the center. There were also several Roman Baths in town. 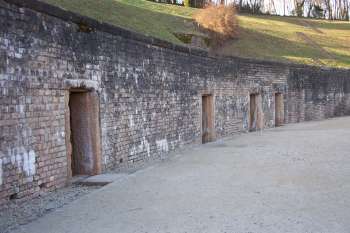 The oldest preserved building is the Amphitheatre, dating from 100 AD. 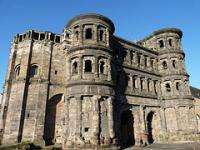 During the reign of Constantine the Great (306-337), Trier became an even more splendid city. He built the Dome/Cathedral, the Imperial Baths, the Basilica and several more Christian places of worship (as this was the empire's new religion). Trier is a small city in southwest Germany, very close to Luxemburg. It has an excellent location along the Moselle River. At first sight it looks like a 'normal' German town, but you don't have to walk far to come eye to eye to Trier's Roman heritage. There's even so much of it that you get the impression that by accident you've stranded in a German town in Italy. There's a lot to see here, so I'll name some of the highlights. The large Dome of course, and the baths. And, somewhat out of the center of town, the huge Amphitheatre. Really interesting also is the regional museum. One room there exhibits large mosaics in good condition that have been found in Trier. At the heart of the museum an ornamented light blue grave monument is the center piece of attraction. How beautiful the streets of Trier must have looked like in Roman Times! 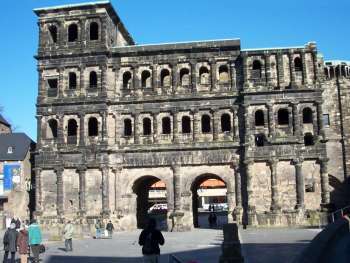 Trier is the oldest city in Germany and packed with Roman monuments and sites to see. 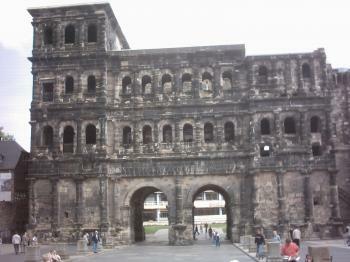 The city's landmark is the Porta Nigra (Black Gate). Close to the Hauptmarkt there are the Dom (which houses the Holy Robe - on display April 13 to May 13) and the Church of Our Lady. Further ahead are the Imperial Roman Baths and the Evangelical Lutheran Church which are worth viewing. A great day trip and worth the overnight stay to see the sites without the tourist groups early in the morning. Trier is the oldest city in Germany and there was a time when it was the second most important city in the Roman Empire after Rome itself - and it shows. I have rarely seen a city with such an impressive array of monuments from Antiquity onwards through many time periods up to the present day - a veritable cross section of European history that is remarkably well preserved (sometimes it helps to be off the beaten track). Of course, Roman and medieval monuments dominate the scene, especially the world-famous Porta Nigra (don't neglect to go inside), the cathedral and the Church of Our Lady next door. The city's history is especially connected to Emperor Constantine the Great and the conversion of the Empire to Christianity. I visited Trier for the huge exposition on Constantine on the 1700th anniversary of his marriage in Trier, which was great, but the city itself impressed me even more. Trier is full of monuments worth seeing. Often overlooked is the town square just up the street from the Porta Nigra. This square turns into a wonderful Christmas Market during December with some of the best food in the country. The town square is also a street or two from St. Peter's Cathedral which is a great example of Romansque architecture. It houses the holy tunic of Christ. I enjoyed the city immensely. If you want to have a walk that you will enjoy, walk through the Kaiserthermen (Roman Baths) or the Ampitheater. Remember the Ampitheater goes down under as well. Not part of the UNESCO site is the birth place of Karl Marx! There is not much there, but it is nice to see none the less. Trier has enough to occupy you for a day trip and makes a great one from Luxembourg as it is only about 30 minutes by train. some 50 kilometers southwest of trier there is the HUNNENRING, a celtic fortress from 300 BC. But it is very interesting, 2 km wall, 10 meter high. Germany’s capital of Roman Antiquity is a magnificent surprise. Located astride the Mosel River about six miles from the Luxembourg border, Trier is little known to most travelers who vacation in Europe, but it should be one of Germany’s most visited cities. The oldest city in Germany as well as one of the oldest and most interesting on the continent, one motto says, “Before Rome, there was Trier.” Legend says that Trier was founded in 2000 BC (1300 years before Rome), and the Romans didn’t arrive until 14 BC. In 41 AD the Roman writer, Pomponius Mela, called Trier “urbs opulentissima,” a very opulent city. … … in Trier while we walked just 2,000 steps, we witnessed and enjoyed 2,000 years of history. The best place to have a look at the beautiful skyline of Trier is at night on the "Petrisberg". All the sites are illuminated and it is just great. Best time is August; warm and clear nights. I have to know, it's my hometown! From "Roman Monuments, Cathedral and Liebfrauen-Church in Trier" to "Roman Monuments, Cathedral of St. Peter and Church of our Lady in Trier"
The Tetrarchy: As Caesar of Gaul Constantius Chlorus chose Trier to be capital of his province which also encompassed Britain (recently reconquered by him) and Spain. A monumental quarter was built including the Basilica and walls/Porta Negra. Helen of Constantinople: According to Western Christian tradition Helena, whilst in Jerusalem, "discovered" the "Holy Tunic" of Jesus (The "seamless robe" worn shortly before or during his crucifixion. Its fate is described in John 19:23-24). She then sent it to Trier where it is now held in a Baroque Chapel of the Cathedral after its recovery from the interior of the High Altar in 1512. Napoleon was here: Wiki :- "During his visit to Trier in 1804, Napoleon ordered that the Porta Nigra should be converted back to its Roman form. Only the apse was kept, and the eastern tower not rebuilt to its original height. Local legend has it that Napoleon originally even wanted to completely tear down the church; allegedly, locals convinced him that the church had actually been a Gallic festival hall before being turned into a church (in another version, they simply told him about its Roman origins); it is claimed that this prevented the destruction of the building and persuaded Napoleon instead to convert the gate back to its original form." 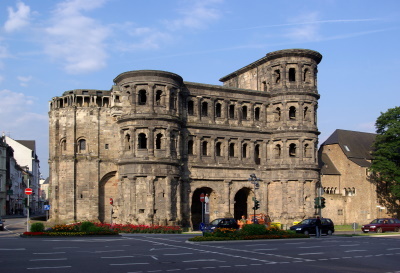 Built in the 4th century: Porta Nigra, Constantine Basilica and the restored Cirucus Maximus, amphitheatre and thermae date from the time of Constantine the Great (305-337).